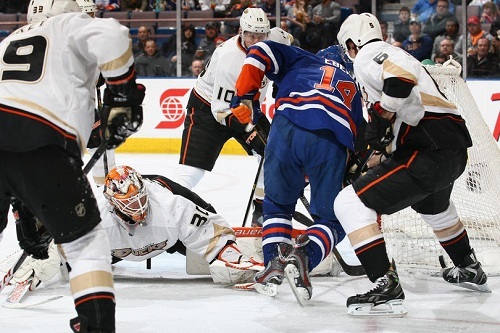 The Edmonton Oilers faced the Anaheim Ducks in back-to-back games, and unfortunately the outcome on Monday wasn’t much different from their April 21 game. The Ducks achieved a 3-0 shutout against the flailing Oilers, whose win against the Colorado Avalanche on Friday night apparently didn’t give them the momentum they needed. The Oilers were mathematically eliminated from the playoff race after the outcome of Sunday night’s game, but a strong finish this season would nonetheless be positive for the team. The Oilers started goalie Nikolai Khabibulin instead of Devan Dubnyk. While Khabibulin did very well between the pipes, unfortunately he didn’t manage to keep all of Anaheim’s 28 shots on goal out. Notably, Ryan Nugent-Hopkins is out for the remainder of the season to get surgery for his shoulder, so Gagner took his place in the top-scoring Hall-Eberle line-up. Anaheim got a power-play less than a minute in, but didn’t manage to make any early opportunities. The Oilers started out incredibly slowly, as about five minutes in they still had absolutely zero shots on goal. Anaheim’s Ryan Getzlaf got a power-play goal at 6:13, a fairly unsurprising outcome given the Ducks’ 7 shots on goal as opposed to the Oilers’ 0. About halfway through the period Edmonton finally began to pick up the pace and start getting pucks to Anaheim’s net, but the next goal was Anaheim’s again, with a wrist shot by Radek Dvorak at 11:48. The first period, which the Ducks really dominated, ended with Anaheim in the lead 2-0. Roughly five minutes into the second period the Oilers were putting some good pressure on Anaheim as they tried to get into the game, and the Oilers’ top line was creating some good chances, but they didn’t manage to make anything happen. The period was scoreless as the Ducks maintained the 2-0 lead they established in the first period. Jordan Eberle of the Edmonton Oilers takes the puck to the net in an attempt to get the Oilers on the scoreboard. Anaheim’s Sami Vatanen scored another goal for the Ducks 3:55 into the third period. In a strong period, it wouldn’t be unreasonable to hope that the Oilers could rally and score three or even four goals and completely flip the game around. However, even with more than three quarters of a period remaining, the Oilers just didn’t seem capable of rallying. They weren’t demonstrating the kind of energy that would lead to a big shift in the game as it stood. Gagner gave a great post-game interview about the Oilers’ unfortunate spiral in the latter half of the season. They’ve definitely had an interesting progression at the end, with a fantastic five game winning streak, followed by a devastating six game streak of losses. While they may not have any chance at the Cup, they can definitely strive to finish the season with some wins. They’ll face the Chicago Blackhawks on Wednesday, April 24.